The start of the year is now a distant memory, as life continues to move forward and I continue to not watch as many films as I’d like to. Who does? I’m not the only person to write this sort of weekly update, and I really feel like my watch history pales in comparison to pretty much everyone else. I genuinely don’t know how others find the time to run a blog, manage a podcast, have adequate relationships with actual real life people, work a full time job and still find the time to watch a load of movies too. I suppose it doesn’t help that I seem to be in a constant state of “doing up the house” which eats away at the weekend like nothing else. Ah well, at least I watched some stuff. In Korea, 1951, the Mobile Army Surgical Hospital receives two new surgeons in the forms of Captain Hawkeye Pierce (Donald Sutherland) and Capatin Duke Forrest (Tom Skerritt). 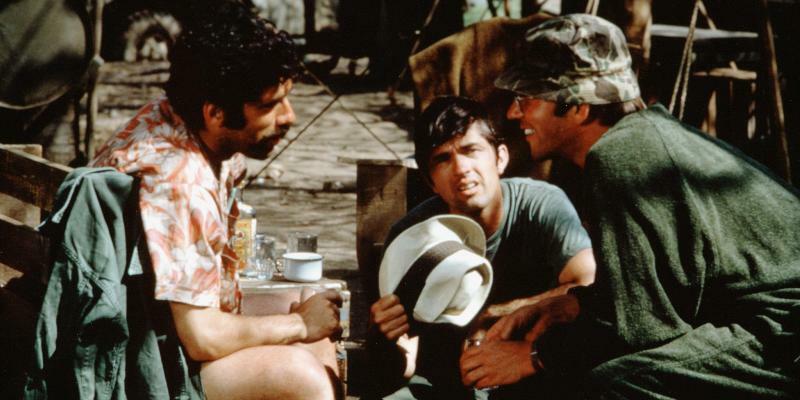 They aren’t what you’d typically expect from army surgeons, preferring to put a large portion of their efforts into relaxing and goofing off instead of actually getting down to work, which doesn’t sit well with the current head surgeon, Major Frank Burns (Robert Duvall). Burns, who also shares a tent with the new recruits, is a religious man who abstains from alcohol, so is essentially the polar opposite of the newcomers, so they set about having him removed from the hospital, and he is replaced by the much more fun-loving Captain Trapper McIntyre (Elliott Gould), with whom the guys have many adventures. Greg (Ben Stiller) is literally on his bended knee mid-proposal to his girlfriend Pam (Teri Polo) when she gets a call from her sister, who has just got engaged and is due to get married in the immediate future, as in a couple of weeks away. Pam casually remarks that her father puts a lot of stead in the tradition of the potential bride’s father being asked prior to the question being popped, so Greg pockets the ring and plans to ask said father when they visit Pam’s family home for her sister’s wedding. However, the visit does not go necessarily according to Greg’s plans, and it’s all exacerbated by the fact that Pam’s father Jack (Robert DeNiro) is not a retired rare flower expert as she has told Greg, but is a former psychological profiler for the CIA, who is very protective of his first born child. Will Graham (William Petersen) is a profiler for the FBI who, after getting too close to his previous case, has taken a leave of absence, or possibly even retired, to recuperate and get his head back together with his wife (Kim Greist) and young son. However, his former boss Jack (Dennis Farina) has a case he can’t crack, and must pull Will out of retirement for one last job. A serial killer, dubbed the Tooth Fairy because of the bite marks he leaves behind, has so far massacred two families with several young children each, but he only strikes on the full moon. With the next one a few weeks away, time is running out for the FBI to find the guy, and with no leads to go on it is up to Will to get into the criminal mindset, and to do that he must meet with a former conquest of his, the incarcerated, highly intelligent but ruthlessly vicious mass murdered Hannibal Lecktor (Brian Cox).